Good day! Over the past year the DPR People’s Militia has considerably improved its battle training level of its units. There was held the tank biathlon, were forced water barriers and was carried out sea-launched assault. It is only some examples of improving skills and level training of all the categories of the DPR army. The situation remained tense on the contact line in the Donetsk People’s Republic. The SMM OSCE representatives daily registered absence of heavy weapons of the Armed Forces of Ukraine at special storage sites and it gives evidences of what these weapons were actively used by the Ukrainian command against Donbass civilians. During the period from January till December, 2016 the number of violations of the ceasefire regime amounted to 143630 times, including with heavy arms – 78223 times. The total weight of ammunitions launched on the Republic’s territory amounted to two thousand tons. There were destroyed 820 house-buildings and municipal facilities of the Republic. Vital support facilities and repair brigades, that came to repair damages, were shelled with artillery and mortars. There were registered facts when repair-workers were wounded. Target showing and fire adjustment of artillery and mortar detachment were carried out with the help of unmanned drones, including impact-detonated ones delivered by terrorism supporters, by so-called volunteers. The enemy’s forces and facilities, that are concentrated in the conflict zone as on December, 2016, amounted to 32 438 soldiers, 213 tanks, 351 units of artillery weapons of 152mm and 122mm caliber, 198 units of mortars of 82mm and 120mm caliber, 84 units of MRLS and to 1154 armored combat vehicles. The military and political leadership of Ukraine did not leave attempts to destabilize the situation in Donbass, despite the commitments taken on complying with the ceasefire regime and even after mutual agreements on ceasing fire, the Ukrainian side kept increasing the number of shellings of the Republic’s territory. Over the past year we registered over 100 provocations carried out by the Ukrainian military along the contact line associated with attempts to break through our positions. The highest number of such kind of provocations were registered in the 4th quarter of the year, after the situation when the Ministry of Internal Affairs Minister Avakov and Ukraine's National Security and Defense Council Secretary Turchinov gave the order to the National Guard units to solve the conflict by taking Donbass by force. And despite the fact that the Ukrainian military were rendered assistance in proving the lethal arms and other material things by foreign countries, all the attempts to seize our positions were ineffective and led to the big amount of losses among the military personnel and military hardware of the Armed Forces of Ukraine. The extreme case of such an attempt took place on December, 28 in vicinity of Krutaya Balka where three AFU servicemen died and four were wounded because of unthinking and criminal actions of the Ukrainian command. According to the official data of Ukraine’s Defense Ministry, the AFU losses amounted to 214 dead servicemen, and to 1324 wounded in 2016. However, knowing inclination of the Ukrainian military leadership to falsify and conceal data on losses from the community, we can only presuppose the real numbers of the killed and wounded. According to the information of the Ukrainian volunteer organizations and hospital staff of the military hospitals both in the “ATO” zone and in the rear area, the number of the dead amounted to 600 and the wounded to over two thousand. The outgoing year was characterized by a new chosen so-called tactics of waging the military actions on the part of the Ukrainian military as in by seizing the localities, being located in the grey zone and this is the rude violation of the Minsk agreements on disengaging sides. By such actions a few goals are pursued. 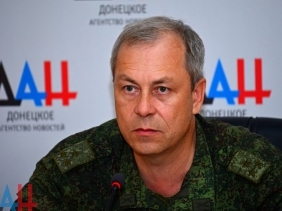 Firstly, by seizing the locality by the Ukrainian side there is announced the so-called another Victory over the enemy without reference to what that the DPR Armed Forces units were absent there. By this the Ukrainian community thinks that the AFU have the alleged successes of the AFU in the “ATO” zone. Secondly, the distance between our positions and the positions of the Armed Forces of Ukraine becomes smaller what allows the Ukrainian side to carry out more actively the armed provocations in relation to the DPR Armed Forces. However, how hard the Ukrainian military command tried to improve the image of the Armed Forces of Ukraine, they failed to do it. The professional army was replaced by the mercenary army of Poroshenko. The people mobilized, even receiving military actions’ experience, are the worst soldiers ever than the career officers. Besides, a lot of criminals, alcoholics and the needy took arms they only hinder to serve those who still can. The bet on the volunteer battalions led to what these “volunteer soldiers” went out of control from time to time and became additional headache both of a command and of civilians. We are noting the increased number of grave crimes on the part of the Ukrainian military in relation to civilians. Robberies and even murders, as in case that took place on the checkpoint “Maiorsk” on December, 14 were a common situation on the territory controlled by Ukraine that does not give a prestige and support to the AFU among civilians. From the beginning of 2016 in the Donetsk People’s Republic at the hand of the Ukrainian punishers there died 314 people, three children were among them. 406 people were differently wounded, 16 children, 323 men and 83 women were among them. Thus, the military and political situation in 2016 was characterized as difficult and tense. The Ukrainian side still did not leave attempts to escalate the situation in Donbass and solve the conflict by force methods that were roughly suppressed by the People’s Militia. Next year the system work on preparing servicemen will be continued that is absolutely necessary because the Ukrainian side is not ready for implementing the truce. Such a situation still continues, the DPR People’s Militia will increase its battle skills and guard people’s calm.